The geological type area for labradorite is Paul's Island near the town of Nain in Labrador, Canada. It has also been reported in Norway, Finland and various other locations worldwide. Labradorization is the peculiar reflection of the light from submicroscopical planes orientated in one direction (rarely in two directions); these planes have never such a position that they can be expressed by simple indices, and they are not directly visible under the microscope. Contributions to the understanding of the origin and cause of the effect were made by Robert Strutt, 4th Baron Rayleigh (1923), and by Bøggild (1924). The cause of this optical phenomenon is phase exsolution lamellar structure, occurring in the Bøggild miscibility gap. The effect is visible when the lamellar separation is between 128 to 252 nm (5.0×10−6 to 9.9×10−6 in); the lamellae are not necessarily parallel; and the lamellar structure is found to lack long range order. The lamellar separation only occurs in plagioclases of a certain composition, in particular, those of calcic labradorite and bytownite (anorthite content of ~60 to 90%). Another requirement for the lamellar separation is very slow cooling of the rock that contains the plagioclase. Slow cooling is required to allow the Ca, Na, Si, and Al ions to diffuse through the plagioclase and produce the lamellar separation. Therefore, not all labradorites exhibit labradorescence (they might not be the correct composition and/or they cooled too quickly), and not all plagioclases that exhibit labradorescence are labradorites (they may be bytownite). Some gemstone varieties of labradorite exhibiting a high degree of labradorescence are called spectrolite. ^ Raman, Chandrasekhara Venkata; Jayaraman, Aiyasami (July 1950). "The structure of labradorite and the origin of its iridescence". Proceedings of the Indian Academy of Sciences, Section A. 32 (1): 1–16. doi:10.1007/BF03172469. ^ Bolton, Herbert Cairns; Bursill, Leslie Arthur; McLaren, Alexander Clark; Turner, Robin G. (1966). "On the origin of the colour of labradorite". Physica Status Solidi B. 18: 221. doi:10.1002/pssb.19660180123. 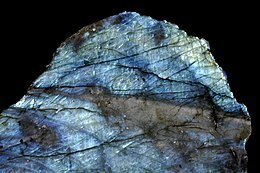 Wikimedia Commons has media related to Labradorite. Wikimedia Commons has media related to Labradorescence. Chisholm, Hugh, ed. (1911). "Labradorite" . Encyclopædia Britannica (11th ed.). Cambridge University Press.